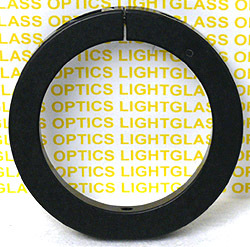 The Thorlabs SMR2C Slip Ring has an inner diameter of 2.185" (with the clamp screw partially released) and is meant to clamp Thorlabs SM series of lens tubes. Of course, you can use them to mount anything you want! The bottom of the Slip Ring is drilled and tapped with an #8-32 mounting hole, so it can be directly attached to standard posts. Thorlabs has changed the design to have flat sides and the new part number is SM2RC. We have ALL the remaining inventory of SMR2C Slip Rings- New in the Package!